Become an entrepreneur? Challenge accepted. I have the distinct pleasure of working with the MaRS entrepreneurship education team at a time when its free flagship series, Entrepreneurship 101, is celebrating 10 years of entrepreneurship education in Ontario. On September 24, the 30-week lecture series will launch its 2014/15 season with a lecture on validating your idea and a brief panel discussion on the future of entrepreneurship in Canada. With more resources available to startups and entrepreneurs now than there were even five years ago, the future of entrepreneurship in Canada is filled with great possibilities. Don’t believe me? According to a 2012 Startup Canada report, 48% of Canada’s workforce worked for small businesses, and small businesses contributed 30% of Canada’s GDP. While survival rates for startups and small businesses are still low, there are a growing number of resources available to help those who are interested in starting their own business. Those resources include Entrepreneurship 101, as well as research that helps us understand how to increase the rate of success, for example, the Startup Genome Report. Even if you are risk averse and don’t want to give everything up for ramen, pizza, long days and late nights, it’s possible to pursue your idea while working a full-time job. 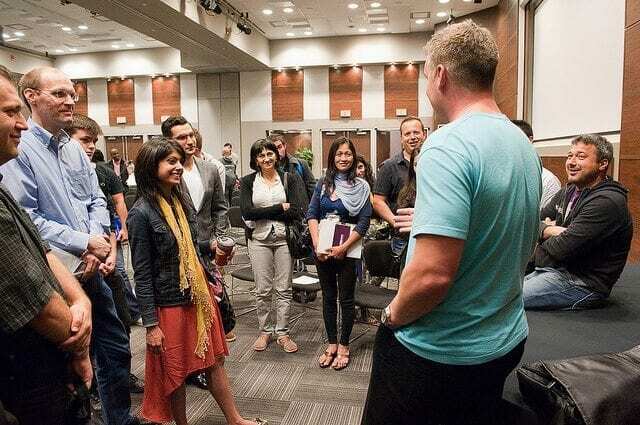 Intuit published a report this year that said, “more than 53% of all new startups in Canada are run by part-time entrepreneurs.” You don’t have to aspire to be a millionaire to run a startup; you just have to know what you love, and know that you want to do it. The same Intuit report mentioned “35% of startups trying to go full time would quit their jobs if they could pull in a mere $30,000 or less.”Entrepreneurs such as Allen Lau have told us that the reason they’ve kept going wasn’t the money, but rather their sense of purpose. So, becoming an entrepreneur is doable. If you still don’t believe me, register for Entrepreneurship 101 and listen to the inspiring stories of successful Canadian entrepreneurs in our Lived It Lecture mini-series. We’ve had lectures from Dan Martell of Clarity, Mike McDerment of Freshbooks and Kunal Gupta of Polar Mobile, to name a few. Download our course syllabus to see which of our lectures will help fill your biggest knowledge gaps, and browse our library for resources to help you along. If you can’t attend our free lectures in person, then you can participate by webcast (including via your mobile phone), for a front-row seat every Wednesday from 6:00–7:00 p.m. When you’re finished being inspired and you’ve realized that I was right all along, you can enter the culminating pitch competition. The Up-Start! competition runs at the end of the season and awards a $15,000 cash prize to the winner.